Designer Marianne Cusato didn’t start the tiny house movement in America, but she does take credit for being somewhat of an influence. Cusato, a 1997 graduate of Notre Dame’s School of Architecture and associate professor of the practice at Notre Dame since 2014, is the internationally known designer of Katrina Cottages, 308-square-foot homes designed as an alternative to the FEMA (Federal Emergency Management Agency) trailers supplied as emergency housing for victims of 2005’s Hurricane Katrina. Cusato was invited to participate in the rebuilding after Katrina by a mentor, Andres Duany, American architect, urban planner and founder of the Congress for the New Urbanism, a design movement that promotes the creation of environmentally friendly and walkable mixed-use neighborhoods. Duany and his wife, architect and University of Miami architecture professor Elizabeth Plater-Zyberk, had been invited by Mississippi Governor Haley Barbour to lead a project to study 11 devastated Gulf Coast towns. Duany invited Cusato to join a group of 200 architects, including 80 local practitioners, to envision “Katrina Cottages,” alternative housing that could both replace FEMA trailers and be built as permanent homes.They arrived six weeks after the storm, in the middle of October. “We were behind the National Guard barricades,” she says. Duany sent Cusato’s quick watercolor sketch of the cottage to the Biloxi newspaper in November. Then came one of those synchronous events that change everything. In 2006 the International Builders’ Show took place in Orlando, Florida. “Outside the convention center, they had houses built in the parking lot,” Cusato says. Duany got a call from his public relations agent, whom he shared with Sarah Susanka, architect and bestselling author of “The Not So Big House,” whose philosophy is “build better, not bigger.” Susanka’s group had reserved and paid for a space, but were pulling out. Did Duany have anything from the Mississippi project he’d like to display? He said, “Yes. We’ll build Marianne’s house.” Then he called Cusato. “We could never have planned it,” Cusato says. Eventually, Mississippi delivered 2,800 houses inspired by the Katrina Cottage to those who lost their homes in the storm. 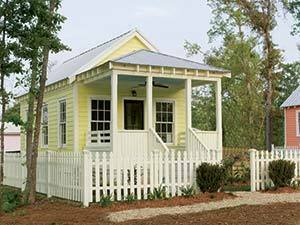 Louisiana has completed construction of 500 units featuring designs from the Katrina Cottage series. Why did the Katrina Cottages, and the growing interest in tiny houses, strike such a chord with people? “The interest in tiny houses paralleled the explosion in the size of regular houses,” she says. In 1973, the average size of a home in the U.S. was 1,660 square feet. In 2006, that number had grown to 2,469 square feet. “McMansions,” generic big luxury homes with no particular architectural style, mass-produced in the late 1980s and 1990s (and derided as “Garage Mahals”) typically had square footage of 3,000 square feet or more. The homes featured multiple bathrooms, four or five bedrooms and lavish interior features. Then in 2008, the mortgage market collapsed. In Las Vegas — formerly a symbol of affluence and over-the-top homes — unemployment increased to more than 14 percent and the housing market slid into a steep decline. In 2010, a Business Insider feature noted that in Nevada, more than 65 percent of homeowners were underwater on their mortgages — they owed more than their homes were worth. Entire housing developments stood abandoned. In terms of our homes, what we should be doing is considering what works for us, she says. For more information and to see more houses and house plans, visit mariannecusato.com. 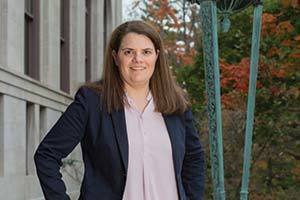 Originally published by Carol C. Bradley at news.nd.edu on November 02, 2016.